Shaggy L Cuddles is a charming giant teddy bear that has an adorably shaggy amber brown coat. This large bear has a dark red bow tie and holds a big bright red heart that says "I Love You" on it (Heart will not be attached [Sewed] to the bear). Measuring 48 inches tall, Shaggy is ideal for snuggling with and holding by your side. All Giant Teddy bears are well constructed, durable, made with child safe fabrics & components and meet or exceeding all US safety standards. This guarantees our big teddy bears are perfect for snuggling with! 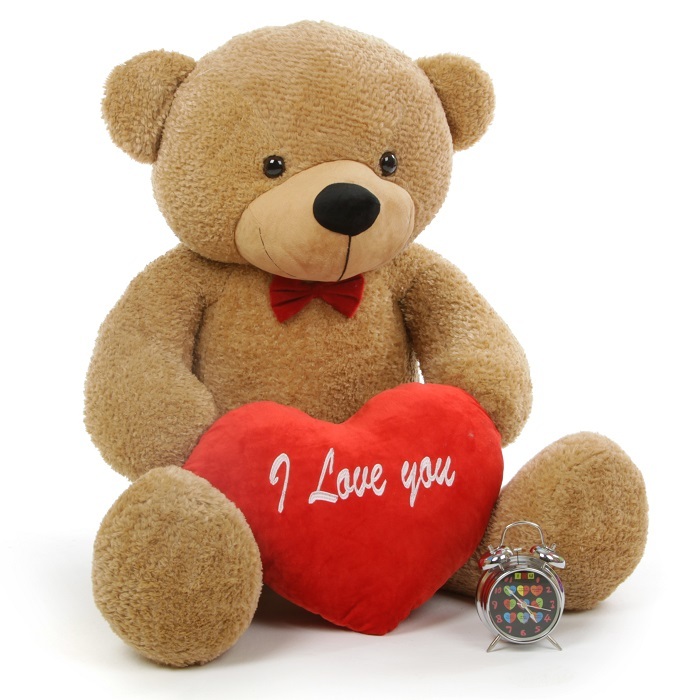 Perfect for a Mother's Day gift or Valentines Day gift, or just to show that special person in your life how much you love them, give the gift of a Giant Teddy bear today. This bear is so soft and amazing. I didn't think it would actually be this great because I'm always being told about online scams, but this bear is the greatest thing I have ever gotten. Perfect gift my girlfriend loved it I thought it was going to be small but it was still perfect size highly recommend!!! !